Here are some more or less random solar energy facts you might find interesting. As you'll see, the sun has some pretty amazing numbers associated with it. 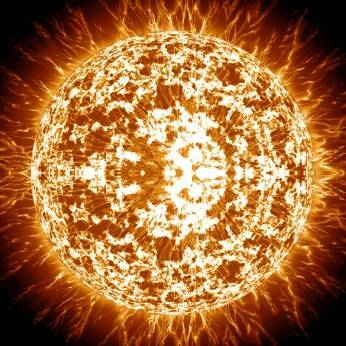 •	The sun’s energy is produced by nuclear reactions taking place in its core. Once produced, the energy travels to the surface by convection. •	The temperature at the sun’s core is estimated to be 15,000,000 degrees C (27,000,000 degrees F). At the surface, the temperature is 6,000 degrees C (11,000 F). That’s cooler but still plenty hot. •	Hydrogen is the main element in the sun (92%). Together, hydrogen and helium make up over 99% of the sun’s mass. •	Roughly 50% of the energy radiating from the sun is in the infrared zone, 40% in the visible part of the spectrum and 10% is ultraviolet. •	The outer atmosphere receives over 1,400 megawatts of solar energy per square kilometer every minute! Only about 50% of that ever reaches the earth. The rest is either reflected back into space or absorbed by the atmosphere and clouds. •	Its estimated that the amount of solar energy reaching the earth in three days is more than could be produced by all known reserves of fossil fuels. •	The amount of solar energy falling on the roof of the average home is enough to supply 1-3 times its energy needs.•	Charles Fritts was an American inventor who made the first photovoltaic cell in 1884. It operated with an efficiency of about 1%. •	Today’s photovoltaic cells operate at an average of 10-15%. Cells operating at 20% have been made and photovoltaic efficiency is improving all the time. •	Charles Kemp, a home heating equipment salesman designed and patented the first commercial solar hot water heater in 1891. It was called the Climax and sold for $25. •	This solar energy fact surprised me: by 1941, more than half the people in Florida used the sun to heat their water. The availability of cheap electricity after World War II ended this trend (the electric company even gave away free electric hot water heaters to encourage electricity consumption). •	Europe’s first commercial solar power plant began operation in 2007. It’s located in southern Spain and produces about 300 megawatts of power a day – enough to supply 180,000 homes.